Improve you life with aquatic arthritis exercise. The buoyancy, support, and accommodating resistance of water enhance exercise and create a safe environment for individuals suffering with arthritis. Exercise is key in an overall health program for individuals with arthritis. Water arthritis exercise promotes joint flexibility, muscle strength, endurance, coordination and balance making the activities of daily living easier. First thing you will need to locate is a pool. warm pool temperature of 83-88 degrees is recommended by the Arthritis Foundation Aquatic Program. Please note: Higher temperatures are not recommended for active aquatic arthritis exercise. Now that you have a nice warm pool, what should you do in the water? Let’s start with a warm-up for 5-10 minutes. A warm-up prepares the body for more energetic activity. The warm-up also reduces the risk of sudden stress to the cardiovascular system and incidence of injury. The warm-up section of your exercise should be done at a low intensity slowly building to more intense activity. Walking, forward, backward, and sideways increasing the speed of your walk and the size of your arm movements is a great way to warm-up and stretch. If you hip joint arthritis pain check out this page for more exercises. The Strength and Endurance portion of your workout are next and should be performed for duration of 10-20 minutes. Using the resistance of the water, speed of movement and body movement one can build muscle and increase stamina. Your are walking at a brisk pace with long arms, ears over your shoulders, shoulders over hips, hips over knees, knees over ankles, chest lifted while you breathe deeply and smile. Continue this power walking for the duration of time or change it up by clapping behind your back or using breaststroke arms as you briskly walk forward, backwards and sideways. Your workout should be finished up with a cool down, generally lasting 5-10 minutes. The cool down is the time for pulse recovery and breathing to return to normal. Repeating the warm-up backwards is a great way to effectively cool down. Congratulations, you have finished your first arthritis aquatic exercise program. There are many resources available for people with arthritis. Your local Arthritis Foundation can be a great resource on-line, via phone or in person. Go to the Arthritis Foundation homepage here. 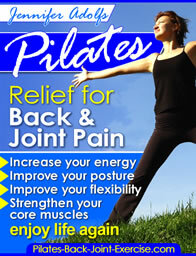 and check out the new Pilates ebook for more low impact and joint strengthening exercises!